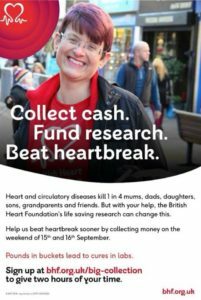 The British Heart Foundations “Big Collection” at your local Tesco store on the weekend of Saturday 15 and Sunday 16 September. In Basingstoke this will be the Chineham Tesco’s! Contact Volunteer Basingstoke to request further information about this event.